I am talking about an entire side of you that you are probably not aware of. For background, consider this. Neuroscience for nearly 100 years treated the body as a type of automobile. “You” or your brain was considered the driver. Back in the early 20th century everyone believed that by now they would be able to take human brains and clone people, and we could all live forever. But for the last 20 years, science has been changing that view. For starters, we now believe that consciousness (mind) is a product of complexity. Secondly, complexity is somewhat related (if one avoids spirituality) to the concept of emergent properties and self-organizing algorithms. Finally, we have also begun to note the reptition of patterns at various scales of the same basic outlay. While in the past cells were considered to be more or less “stupid” with no real conscious ability, we now know they make hundreds of autonomous decisions. In fact, the entire arising of thought seems to come from the individual impulses of a few neurons’ desires sparking interest in other neurons. That is not a very deep concept when one considers addiction to sugar. but what about something like love or guilt? Are we really to believe that these arisings of neuronal activity are mere chemical requests for stimuli produced by hormonal factories like the pituitary and hypothalamus? Poppycock. 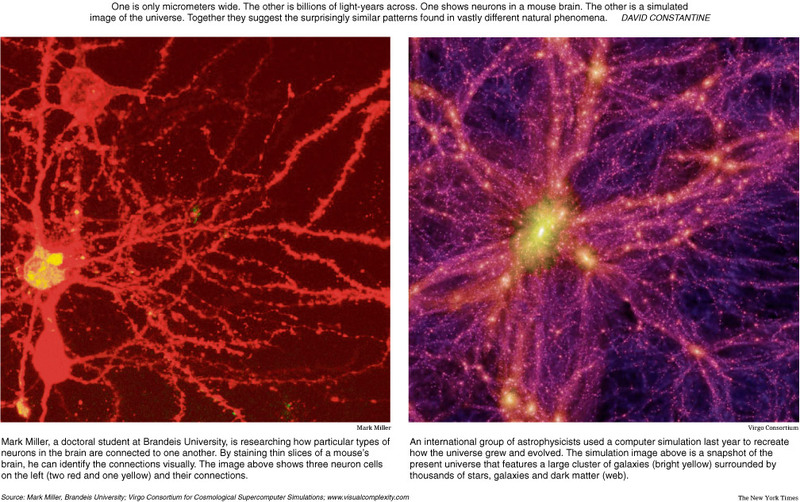 The Universe is a fractal one. No matter how much you zoom in on it or zoom out, you get repeating designs. There is therefore no reason to suspect that consciousness, however self-aware or not, does not arise on every level. We cannot measure the thoughts of bacteria, solar clusters, mountain crystal groups or mycelium colonies, but we can be sure there is some form of communication or transfer of data via electron exchange and plausibly Dark Energy (Qi?) and magnetic fields. Physics these days is heading more and more “mystical” and leaving behind the boring Descartes-Newton billiard ball Universe. Reality, it seems, is simply not that simple or boring. It is conveniently so just for us at this level (where we only see 7 colors in the middle of an infinite spectrum; 7 colors, 7 chakras… not a coincidence!). There are nearly as many neuronal connections (complexities) contained in the Enteric Nervous System as in the entire primal regions of the Central Nervous System. And if you add the entirety of the Peripheral Nervous System to it, there are as many connections in the whole of the body, or more, than the entire CNS! If consciousness – or if we mean to say non-aware consciousness, let us call it ‘spirits’ for translation purposes – arises from complexity as an emergent property, then we have to consider for a moment the distinct and ever-increasingly-evidenced possibility that we are not “alone” in our bodies. Here is another fact: both Ayurveda (3,500 year old medicine from India) and Chinese Medicine ascribe spirits to the organs and tissues of the body. As a matter of fact, both of them, AND the Jewish (and Greek) mystical systems of meditation ascribe 12 channels to 12 organs, 7 energy centers (plus a soul) to the 8 deeper channels. They are more accurate than the billiard-ball “cogito ergo sum” approach to neuropsychology. Moreover, more and more psychologists and psychiatrists are studying alternative systems and newer and newer cognitive based systems which recognize the spirt-mind-body aspect of life. This is not an article about the sayings of Jesus. But interestingly enough the quote, “The Kingdom is Within You,” was not only a Christian one. It is the basis of the entire TCM psycho-spiritual paradigm. The idea is called Ming or Heaven’s Mandate. The basic philosophy is that each of the 12 organ systems are regions of the “kingdom” (lit: body) run by the 11 Ministers and 1 Emperor which we can take to be the “spirits” of the organs. Spirits here connotes an emergent consciousness from the neural complexity inside organs. They may not think very complexly, but more and more therapists and doctors of all kinds are noting the tendency of the body, especially muscles (channels) and organs, to memorize trauma and affix these traumatic memories in specific locations. The implications of this are HUGE. Could cancers, tumors, lipomas, cysts, diverticuli, and other growths in the body merely be collections of memory-information stored in non-conscious locales, presumably to avoid having to think about them? Whether or not it is true, the therapies that act as if this is true are considered highly effective and prized by acupuncturists, therapists, and chiropractors alike. If it works, then there must be something to it, even if it is not well understood to not as simple as “spirits” or “ministers” that govern a kingdom. And consider this: anxiety, depression, nervousness and palpitations are all linked in the region of the “heart chakra” (RN17, master of all bodily Qi) in both mental and physical symptoms. Also, the Taoist Mysterious Pass is considered to be the connection between this central Dan Tian and the lower Dan Tian and the upper Dan Tian (pre-frontal cortex, Yin Tang area); this is said to be the crux of longevity and enlightenment. Meanwhile the Vagus nerve, CNX crosses through this area to connect the heart, stomach, lungs, and liver to the brain. Meditation research has long established the connection between meditation and the para-sympathetic nervous response which reduces stress and enhances release of catecholemines, endorphins, and seratonin (possibly opiods and cannaboids)! Could it be that our Heart Emperor in TCM is actually the nerve cluster of the heart’s bridging connection between respiration, digestion, reproduction, and cogitation? Could the pre-frontal cortex access these networks via the vagus nerve (Stomach/Chong Channel) in order to regulate the body and balance hormones? Meditations systems around the globe agree the answer is yes. And so does a lot of research that never makes it to the mainstream (probably because it does NOT support the cut & dose with drugs approach to “health”, aka Big Money). What follows is not really taught in TCM schools nor anywhere else. It is gathered from clinical data of what I tend to see. Please bear in mind that the Kentucky region is prone to dampness and stagnation, and so body types as well as their reactions to the food, environment, and other external stimuli may differ greatly from other areas of the country and world. Liver-qi stagnation that results in cognitive block (ie: hyper-active ego). Body changes: yellowing or reddening of sclera, deviated tongue (left for pancreatic side, right for liver side; please recall the Liver Qi refers both to organ activity and PNS activity), gallbladder pains, IT band lock, increased arches or other foot deviations of 1st and 5th phalanges, repeated throat issues or even thyroid and para-thyroid issues, tinnitus, vertigo, headache, lumbago, and distal arthritis.If a person has any or many of these symptoms – and their tongue, pulse, and lifestyle match – it may very well be that their Sympathetic Nervous System has crossed the critical threshold and they are on their way to heart disease, diabetes, autoimmune disorders, stroke, or even psychiatric or epileptic disorders. The threshold is different for different ages, sexes, demographics, and is generally very individual. There is an increased risk if they are on multiple medications (invariably ones related to liver, heart, or mind issues already, since wood burns to generate fire). Solutions to these issues range from moderate to intense cardiovascular exercise to reduce CNS hyperactivity, to forced relaxation/meditation/vacationing, to slow-type exercises, lifestyle changes, dietary moderation, drastic reduction of caffeine/stimulants and drugs, and therapies like acupuncture, massage, and herbs. Body changes: formation of knots, scar tissues, fascitis, lumps, nodules, cysts, fibroids, and tumors; locked diaphragm, apple-shaped body, metabolic changes, colon and urine incontinence, block, or drainage, prolapses, skin tags/liver spots and other growths on the skin; glaucoma, pterygium, or cataracts; hearing loss, taste loss, appetite loss, or similarly, lack of interest in fluids; fungi in the channels of the toes, usually 1st, 2nd, or 5th phalanges, arthritic changes in hands and feet, etc…The above changes are the result of channel failure. Channels are rather like hoses, but also like power-lines. If they are not full they have not enough pressure to move, but if too tight they cannot transfer. If they sage or fall, then the Qi cannot flow (is not flowing, hence sagging). Channels can become blocked from lifestyle, posture, injuries/falls/car wrecks, stenosis/bulges/facet subluxation along the spine that impinges on the nerves emerging, clots, and myriad other things. Infections or growths (including gout) can also block channels. After a long time the channel fails to nourish the distal parts of the body or the sense organs, and worse, fails to feed Qi into the next channel which returns to the organs and the organs starve of vital substances. When this happens the result is the tissues and organs send waves of anxiety up into the CNS in order to “report” it. However, a person is only capable of “hearing” a certain small cluster of changes because of daily life, etc… as well as the normal functioning of the Reticular Formation which blocks “non-essentials”. When this occurs, it may often be that a problem goes unnoticed for decades until an event changes the status quo. Then suddenly the person notices it and possibly many other issues. This tends to happen around 40s-60s when people start self-examining their lives and bodies, evaluating issues. This sudden awareness, along with natural degeneration produces multiple anxieties and stresses, which culminate (crescendo) in panic attacks, depression, and anxiety. As for cases of “excessive body armor” which a person produces in their traps, lats, and back muscles, most of the time I find these knots and hard muscles to be the result of bad posture, over-work, and hating their job. Ever heard the saying “thick skinned”? This is a true thing. When a person is repeatedly stressed from “external” stimuli such as a demanding job, fights with a spouse, driving in traffic, etc… they will often develop very hard muscles in the back and neck. these are cured mostly through cupping, guasha, massage, acupuncture, and lifestyle changes. Herbs may help to reduce stress as well as increasing consumption of mint and reducing coffee intake. Included in this are body changes in fat percentage, hormone balance (especially estrogen), alcoholism (or any hepato-splenomegaly), drug abuse, excessive use of antibiotics and steroids, arthritis of the whole body, and even psychiatric disorders such as excessive escapism, hording, and addictions to shopping. The problem here is an addiction to blockage of Original Qi, presumably induced by the invasion of Damp Qi (bacteria, yeast, fungi, fat, humidity, food additives, sugar and alcohol). The addiction to the state of being Unaware can be likened to being like a “dope-head” which is to say a person addicted to the cannaboid receptor stimulation that results in reduction in “pain”. Soemtimes facing life is very painful, and people are not willing to do it.Solutions take the form of rigorous self-examination, honesty, friendly observation offered not as advice but as humor or self-disclosure, as well as vice-swapping less bad vices for dangerous ones (such as gum for smoking, or exercise for pot-addiction, or ginseng for coffee, or diet soda for soda-addiction). Cognitive Connection to the source Qi (God or Matrix, whatever you want to call it) is a health right, and also a health responsibility. Those who feel connected report feeling happier, more productive, purposeful lives, and I have personally noted they avoid criminal, deviant, and dangerous behaviors that harm other people. They are less angry and avoid – or somehow have avoided for them – other angry, dangerous people. They don’t put themselves through the same undo stresses, and they don’t respond to stresses the same way. Hopefully, if one is armed with the above, and reads a few other of my articles, one can start noticing the difference between when your mind is the culprit of your emotions (vis-a-vis habituation and thought-patterns and beliefs), and when the BODY is. Often you are experiencing pain, anxiety, depression, and other issues not because you are a bad person, stupid, or are a victim of happenstance, but because something else is going on within you to which you have been hitherto-fore unaware. Unawareness makes one a victim. Awareness makes one powerful. And after all, you are your own best practitioner, IF you can learn how to discern your body. A good followup to this MHS article will be a regular article about noticing hot and cold, dry and damp in the flesh and administering self-treatment. From there we may talk about some very serious psychiatric disorders which require immediate medical assistance to avoid, in essence, karmic disruption and even dissolution (death). So stay tuned to the MHS articles!